Christine travelled to London after finding my website on the internet. She is a naturally beautiful lady who just wanted to put her looks back to where they were. With lovely bone structure, my job was easy, I just had to elevate her muscular soft tissue back up to the mid face, and reduce some fat with microliposuction. 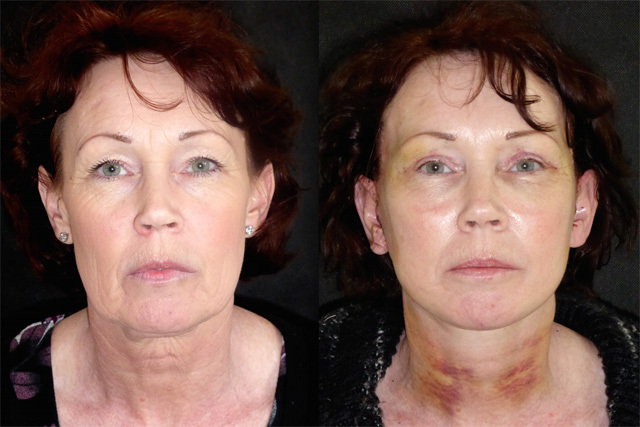 I performed a facelift, neck lift, brow lift, upper blepharoplasty and jowl, jaw and under chin liposuction. Here is her story. Christine has breezed through her surgery. 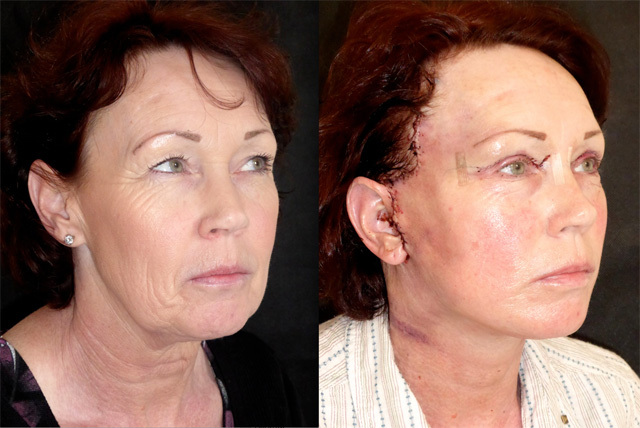 Following her hair wash and lymphatic drainage we can already see her natural face shape again. 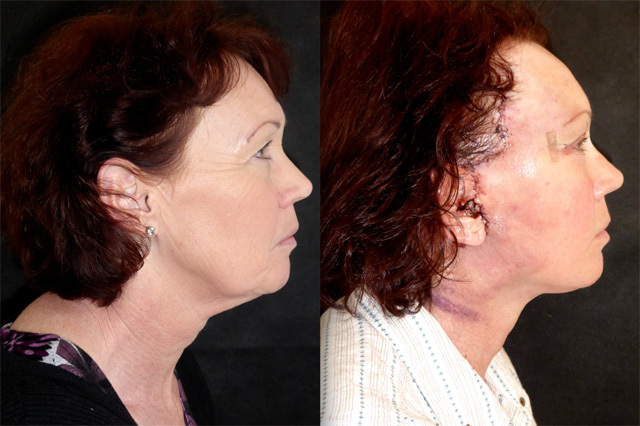 Despite quite vigorous liposuction to some stubborn fat deposits in her jowl, jaw and under chin areas, she doesn’t really have any discomfort at all. 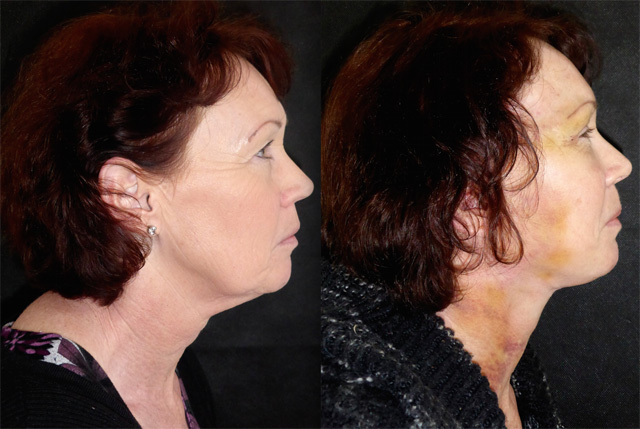 Her neck line and angle is now back, her eyes are much better framed and her face shape is restored. Christine has come back to see me for removal of her stitches. She is doing just great. Despite make up in the before photos, her afters look fantastic. 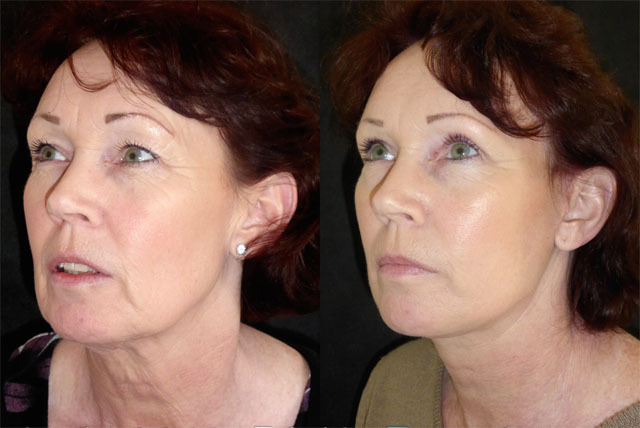 A gentle feminine jawline and youthful midfacial fullness. Her brow line is sweeping and slender and her upper lid show is really going to maximise those stunning eyes with a little mascara and eyeliner. 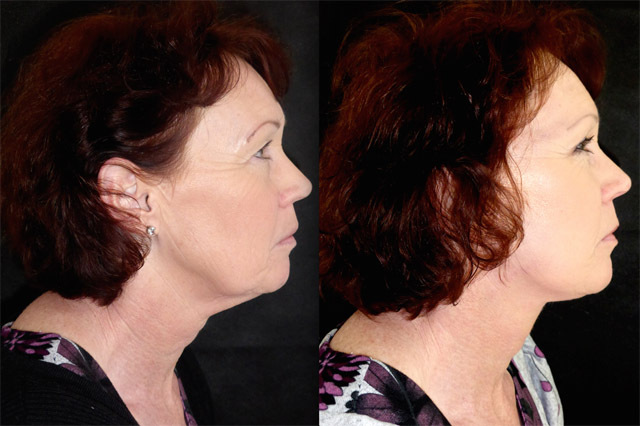 No more jowls or loose neck skin. Bruising is on its way out after the liposuction. I am really looking forward to seeing her result at her four week review. Here is Christine at week four. Her neck skin laxity is much better and she has a lovely neck and jawline. She tells me this is the first time she has been able to put eyeliner on in years. 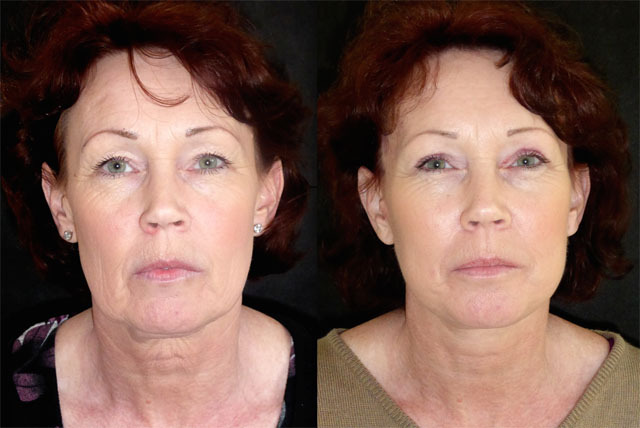 In the 3/4 view we can see the naturally rejuvenating effect of elevating the mid facial soft tissues. 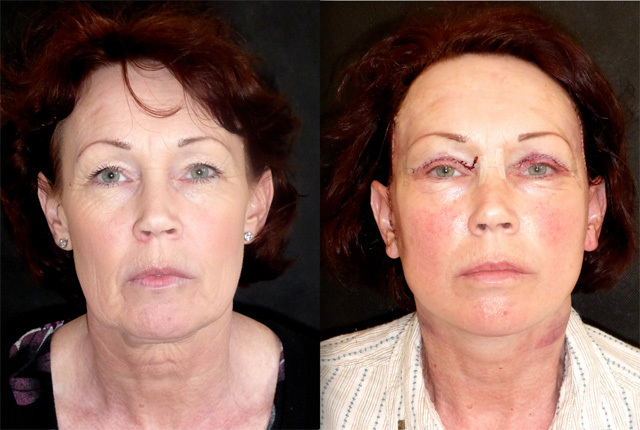 Her under eye hollowing has also significantly improved despite no lower lid surgery. Christine scheduled an extra appointment with me today to check her eyelid scars which are still red 8 weeks out as shown in these minimal make up photos. 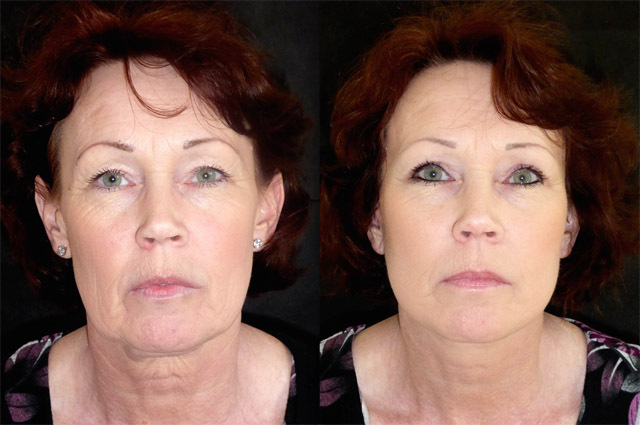 This is uncommon in blepharoplasty but not unheard of. There is no sign of infection or poor healing and they will settle just fine given a few more weeks. 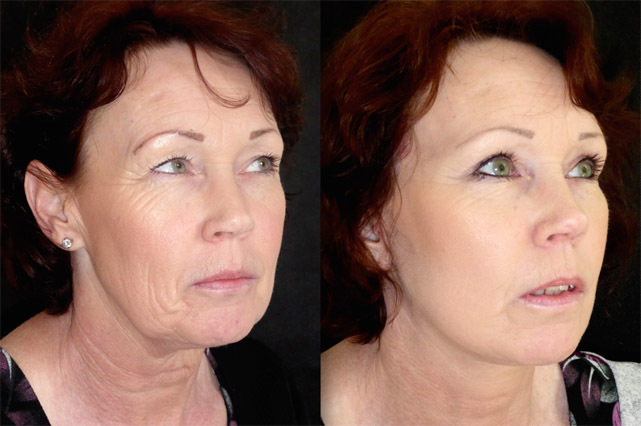 The beauty of the upper eyelid incision is that it is hidden right in the the upper eyelid crease so easily disguised. 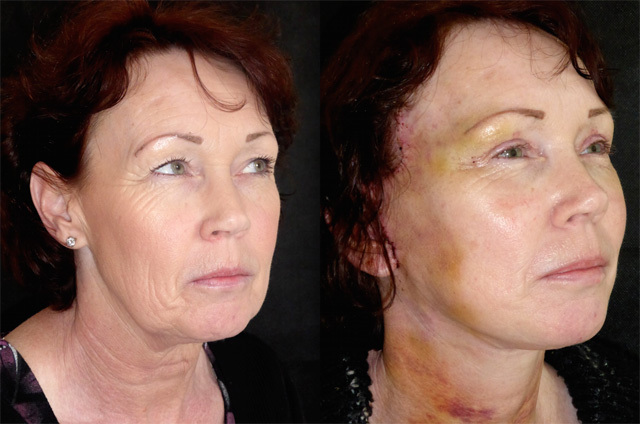 I am grateful to Christine for letting me show these photos, the outcome of surgery can not always be 100% predictable, and I like to be open and transparent with any prospective patient considering the surgical route. It would be so easy to just put up my best results time after time! Having said that, Christine’s result is fantastic. She looks refreshed, natural and well. 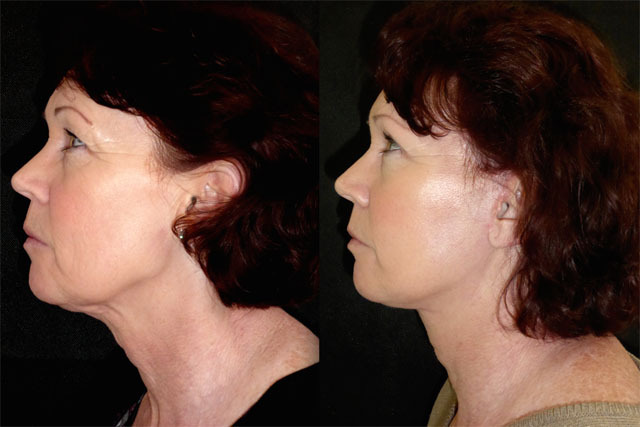 A hidden jawline and sagging neck has been sculpted to reveal a defined, shaped and volumised face. And such a nice lady too!